Bieber now has 54 K's, just 3 BB & a 1.23 ERA. 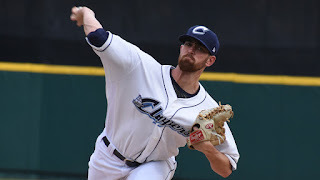 The Cleveland Indians Shane Bieber has now split his 58.1 innings almost evenly between AA and AAA with equal success. He has totaled 255.2 career IP in the Minor Leagues and owns a WHIP of 0.99, ERA of 2.25 and a 237:15 K:BB ratio! Who knows if Danny Salazar will make an appearance this season, as he deals with a shoulder injury and the Indians do not have a 5th starter, as seen by Josh Tomlin (6) and Adam Plutko making a combined 7 starts this season. At a game under .500 and currently in 1st place in the American League Central, I would not be surprised to see the Biebs making a start for Cleveland sooner, rather than later! The Philadelphia Phillies Cole Irvin scored 49.6% of his seasons total points over the past two weeks - the most among the pitchers listed below. His last three starts have totaled 20 innings, allowing one earned run, while striking out 19 batters. Aaron Slegers and Mike King are the only others on the list to have scored 40% of their season total in the last two weeks. Be sure to follow Paul Martin on twitter, @PaulTheMartin, for a break down of the weeks Top Prospects over at Prospects1500.com.